TBS INTERNET provides a tool that will help quicken, ease and lighten the oder process of your SSL certificates. Digital certification can be, as soon as the order deposit, complicated. That is the reason why we inaugurates keybot which goal is to manage the generation of your private key and CSR and to send us the elements required to your SSL certificate creation. WARNING: List of software that are not compatible with Keybot. 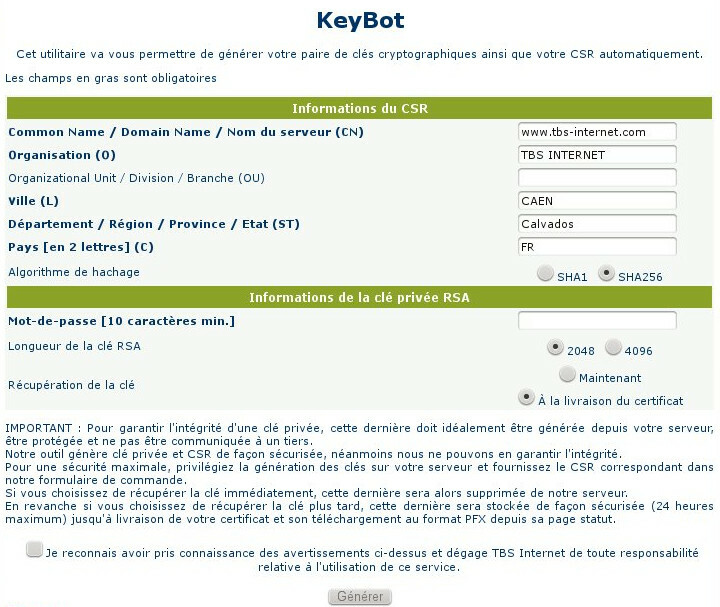 Automatic: Done by Keybot, this service (free) generate the private key and CSR and send the latter to us. Just click on the "Generate CSR" button. In that case, the area, where you will paste the CSR you generated on your server, reappears. Follow then the "classical" procedure. After clicking on the "Generate CSR" button, a window opens. 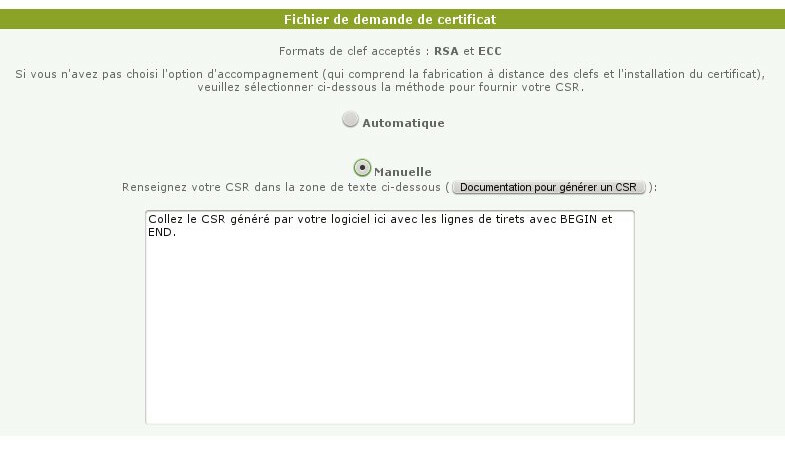 Here, enter the CSR information (the form is filled-in with the information of the account holder by default). Edit what needs to be edited then go to the key information. Now: download the private key immediately and save it carefully (.pkey file protected by the password you defined earlier). Upon certificate delivery: your key will be delivered along with the certificate. Warning: We only store the private for 24 hours. After this timeframe, the key will be lost and you will have to reissue your certificate with a new private key and CSR. Please note: Keybot only generate RSA private keys / CSR. a window opens and, if everything went well, confirms that the private key and the CSR have been correctly generated, that the key has been stored and that the CSR has been sent to us for the order process. Your private key will be delivered with the certificate. A window opens to allow you to download the private key ( .PKEY file). Go on the certificate's status page. In that case, on your certificate status page, click on the "Generate PFX" Button. A popup opens asking you to select your private key (.pkey file yousaved during the certificate order), its password and information about you futur PFX file. Click on "Generate" and save your pfx file. Go on your certificate's status page, click on "See the certificate" and download the certificate in the wanted rormat (usually a .p7b file containing the certificate and the certification chain). In that case, and as indicated on the delivery e-mail, you have to go on you certificate's status page to generate a .pfx. The .pfx contain the certificate, the certification chain and the private key. Click on the "Generate PFX" Button to obtain your certificate, the certification chai and the private key. To get you .pfx or .p12 file, provide the private key password (defined during the order). Then define a password for the .pfx file and enter a name for this file. Once it is done, click on "Generate" and download your file. For now, Keybot is only available on some server products.